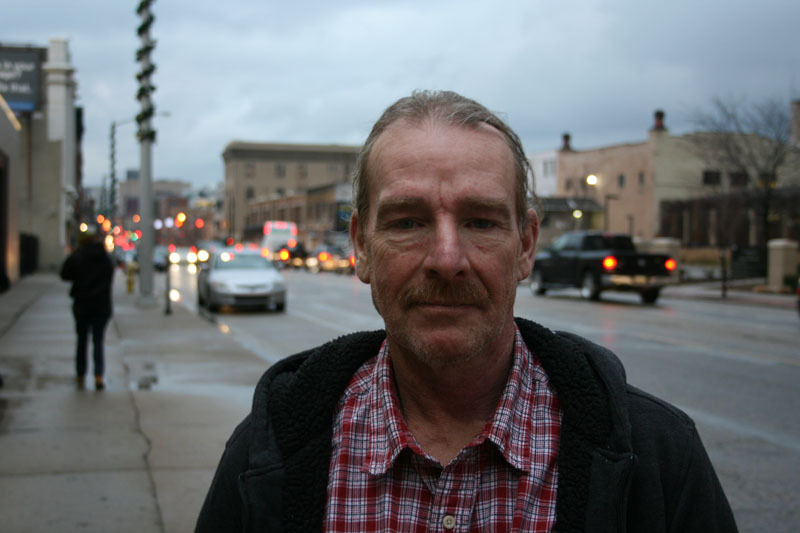 In a downtown Grand Rapids shelter, the man reflected on what for him has been a bleak decade. A high school dropout, he’d worked in an auto body shop and in production at the office furniture maker, Steelcase, Inc., making as much as $50,000 a year. But in 2003, after 13 years, he was caught in a wave of job cuts that swept through the furniture industry. From there, Dave, who asked that his last name not be used, saw his career ‒ and health ‒ spiral. Work as a $12-an-hour painter in a body shop was ruining his lungs, so he took a factory job for $11.50. When that ended, he unloaded trucks for $10 hourly. A recent academic analysis suggests the series of stresses Dave describes are taking a deadly toll on hundreds of thousands of men and women like him – middle-age whites across the nation with a high school education or less. According to the study, by Princeton University economists Angus Deaton and Ann Case, death rates for white, less-educated adults age 45-54 climbed 22 percent between 1999 to 2013, even as mortality rates for other groups fell. The findings are a reversal for this group following decades in which they, like other Americans, were living longer and healthier lives. Perhaps the study’s most striking finding: Most of the increase for this white group was due to overdose of drugs (legal and illegal), liver disease tied to alcohol abuse and suicide. While the Princeton study did not break out numbers for Michigan, data kept by the state suggests a similar phenomenon at work here; a trend that could have serious implications as the state’s aging population moves unsteadily toward retirement. Overall death rates in Michigan fell by 13 percent from 2000 to 2013, according to the state. The declines have been even more promising for African Americans, who saw mortality rates drop nearly 18 percent over this period. Black men and women in the 45-to-54-year-old group showed even greater improvement, with rates dropping 27 percent. So too, white Michiganders as a whole did just fine, with a decline of 12.3 percent, according to the Michigan Department of Community Health. But for middle-age whites in Michigan, a grimmer trend. Why the spike for this segment of whites while rates for African Americans and Hispanics continue to decline? David Weir, director of the health and retirement study at the Institute for Social Research at the University of Michigan, told the Washington Post the results are striking given that whites as a group have higher incomes, better education and other societal advantages that work against blacks. “In this case, that’s not happening,” he said. He said the loss of jobs ‒ particularly in the manufacturing sector ‒ in recent decades seems the most likely culprit for the rise in mortality rates. “These are exactly the people who have been hammered economically more than any other group for the last 40 years,” Ballard said. It is another troubling signpost for what appears to be a diminishing middle class, a slide that has been especially notable in a manufacturing state like Michigan, where median household income fell from an inflation-adjusted $64,778 in 1969 to $49,418 in 2013. The drop parallels in many ways the decline of the state's Big Three automakers, a fall that steepened in the first decade of this century. According to Michigan's Department of Technology, Management & Budget, Michigan shed more than 430,000 manufacturing jobs in the first decade, from nearly 900,000 jobs in 1999 to 463,100 in 2009. The state lost more than 700,000 jobs of all types during that time. This hit workers of all ages hard, but losses were particularly tough on high-school-educated workers many of whom lacked the skills or knowledge to adjust to a changing economy. For those with no other marketable trade, the alternative in a depressed economy might be a job at the mall or flipping burgers at just above minimum wage. Compounding the blow, wages in Michigan continued to fall even as jobs disappeared. Analysis by the Michigan League for Public Policy, a nonprofit Lansing-based advocacy organization, found that Michigan fell from fourth highest U.S. median wage in 1982 to 24th highest in 2012. In 2014, whites in Michigan with a high school degree earned $26,372 a year – a fall of 17 percent from 2005, when adjusted for inflation. For whites with less than a high school education, annual income fell even more steeply, from $23,142 in 2005 to $18,457 in 2014. There are about 500,000 whites in Michigan age 45 to 54 with a high school degree or less. While economic setbacks might explain a lot, the puzzle is why this group appears to have suffered rising mortality rates while death rates continue to fall among African Americans of similar age. After all, African Americans in the United States have a poverty rate nearly three times higher than whites, a status that is normally associated with poorer health outcomes. In Michigan, African Americans are even more likely to live in poverty than whites – 34 percent of blacks are in poverty, compared with 11 percent of whites. And in 2012, the share of black adults in Michigan with no high school degree was twice as high as whites, at 14 percent of the black population to 7 percent of whites. The national study points to a trio of causes for the middle-age white mortality rate: Disproportionate numbers of less-educated middle-age whites are turning to drugs, alcohol or suicide as a way out. From 1999 to 2013, the study found sharp increases in death rates among middle-age, non-college-educated whites from accidental drug and alcohol poisoning, chronic liver disease and suicide, while death from diabetes remained relatively flat. Mortality rates from all causes among less-educated, middle-age whites stood at 736 per 100,000 in 2013, compared with 582 per 100,000 for black non-Hispanics and 270 per 100,000 among Hispanics. Other research confirms that middle-age Michiganders in general are increasingly losing their lives to drugs. Though not broken down by education level, a 2014 study by the Michigan Department of Community Health found that Michigan residents in the 45-to-54-year-old range had the state’s highest death rate from drug overdose. The overall death rate from overdose quadrupled between 1999 to 2012. According to the U.S. Centers for Disease Control, Michigan's 2014 death rate from drugs stood at 18 per 100,000, an increase of 13 percent from the previous year. That exceeded the national average of 14.7 per 100,000. Douglass Judson, a Grand Rapids social worker and counselor, said he’s not shocked by middle-aged drug fatalities. He’s been seeing working-class clients, some of them clinically depressed, stressed over job loss for years. This has been the case even as Michigan's economy has come back from the worst of the Great Recession. Judson said that it is typical for individuals to personalize events in their life beyond their control. So when a worker loses a job, or a series of jobs, and maybe their house, they often blame themselves. And in many cases, Judson said, such individuals “self medicate,” turning to drugs and alcohol to numb their sense of despair. That only compounds their ordeal. “Substance abuse increases depression and anxiety. It would increase mortality,” he said. As workers struggled through the layoffs of the past decade, Michigan has poured billions of dollars in federal funds into job retraining through its network of regional job agencies called Michigan Works. Whether it has been effective is far from clear. A 2011 report by the Michigan Auditor General found problems in the state’s management of the Michigan Works, concluding it did not have data to prove its effectiveness in training and placing the unemployed in jobs. It found that some agencies spent as little as 3 percent on direct training. Gov. Rick Snyder has repeatedly decried the lack of qualified workers to fit job openings, particularly in skilled trades including tool and die work, welding and advanced manufacturing, fields where many employers today require more than a high school degree. Many report an ongoing lack of qualified candidates for open positions, as state officials estimate there are 8,300 job openings in a variety of skilled trades. But Ballard, the MSU economist, said there were limits to what retraining can do when hundreds of thousands of jobs disappeared in a decade. “During a downturn as large as the one Michigan suffered in the first decade of this century, there are limits to how much can be achieved by retraining programs. If someone has lost his or her job in manufacturing, but if jobs are drying up all across the economy, it’s an uphill battle,” he said. Substance abuse treatment for those who need it is another matter. Reagan said access to substance abuse treatment is improved for many working poor under Michigan's expansion of Medicaid. But he said in many cases those who would benefit from treatment don't access care because of the stigma attached to addiction, lack of coordination between the medical system and treatment network and a shortage of specialty treatment options. Doctors may fail to follow up on indications of a substance abuse problem, such as anxiety, depression or difficulty sleeping. “There is a big effort underway to increase screenings (for indications of substance abuse) and early intervention,” Reagan said. At the Guiding Light Mission, a man named Bob, 52, slim, with a pulled-back ponytail, said he fared all right with his high school degree until drugs and alcohol caught up with him. A 1982 graduate of Wyoming Park High School, he served three years in Army and then found work as a carpenter on home construction. “I started using five, six years ago,” he said, a regime that included alcohol and cocaine and, occasionally, heroin. He divorced six years ago and lost his house to foreclosure two years later. In his lowest moments, he said he thought of suicide. “I made plans, thinking I would make it look like an overdose, so it wouldn't be so hard on my family,” said Bob, who also asked that his last name not be used. Instead, he checked himself into the mission, where he hopes to get back on his feet. But he said he knows of plenty of others his age who are struggling. Very good info here. Thanks for this article. I do have a question: Like other pieces I've read about this phenomenon, this one focuses exclusively on white males in that age group. But it doesn't look like the data is only referring to men. So how are women in this group faring? What are their stories? What are the differences? Hope you'll follow up on that. Thanks. I don't know if this is State-wide but in some areas there is a need for welders, carpenters, plumbers, electricians and even truck drivers. Hopefully our high school counselors are aware of the situation and trying to guide younger people toward these jobs. And even older workers could be helpers for these trades which would relieve the shortage as well as the unemployment problem to some extent. For the past 30 years politicians have been saying people need to be flexible with the changing economy. Easier said than done. They encourage people to simply go to school and learn a new career. They tell middle aged adults already in difficult times to take out loans if necessary. In the meantime our shameless governor and the Republican state legislature lack any real solutions for the job losses except for more corporate handouts, skyrocketing higher education costs, more regressive taxation, and more uncertainty and anxiety for the working and middle classes. Hard to imagine Michigan surviving when car sales inevitably go down again in the next few years. The economic and social foundation to ride out the tough times simply isn't there. Great article...Guiding Light Mission has been actively changing lives for the better for several years under the able leadership of Stuart Ray and a strong board of directors. Looking after each resident's safe housing, diet, transportation, job training, counseling and eventual graduation/return to independent living and employment starts with faith in the human spirit and in God. All of the above are of equal weight for the staff and the results speak for themselves. It's worth the time to see for yourself... ask for a tour and to meet some of the staff. Bravo GLM! As a former high school counselor and part time home builder, I would like to add a few words. Until individual companies are willing to assure jobs to graduates of programs that the company has helped set up it makes no sense to keep retraining people in the hope of some one hiring them. Other countries like Germany, have programs where companies work with schools to set up programs to train their workers. These companies share the cost of the training. Then hire the graduates. The numbers alone show the futility of retraining as a solution to this problem. Loss of over 400,000 manufacturing jobs vs the 8,300 skilled trade jobs that state officials say are going unfilled. What we're experiencing here is a massive shift in the demand for unskilled workers. This in turn causes a significant economic displacement of a huge number of workers, desperation, discontent and unrest, and demands to make things the way they once were. Unfortunately those high-paid unskilled jobs are NOT going to come back - not now, not ever - and they certainly won't come back because some demagogue says they have a magic wand that will change that. Instead, we need to figure out how to help people caught in this displacement weather the storm and ensure that we're not pushing even more people into that unskilled, uneducated demographic. Doing so requires that we as a community address this problem, because it is our community that will bear the cost in the long-run. Unfortunately, we're operating in a climate in which certain issues are viewed as a zero-sum gain, where a benefit reaped by one segment of our population is seen as incurring the cost on another, usually more successful and powerful segment. Why not try offering classes or groups to help people overcome the materialism and need to always have more and focus on the really important things (i.e. finding a purpose in life, improve social ties with family & friends, improving things in ways you have the power to change,...), especially in areas with higher underemployment? If education is key, why not offer more trade school, and AP/college classes in school and open it up if their are open seats to legal citizens living in the school district and then legal citizens working in the district. In high underemployment areas allow students to have a grade 13 option and/or victory lap option like Ontario did/used to do. A Saturday only school option for tutoring adults and/or students who need extra help, want to move ahead, or a place to go and learn something new (i.e. learning a trade, 3-D printing, what skills are needed in jobs available in the area, how to prepare for college, how to make a portfolio of your skills if you are self-taught, sources to teach yourself useful job skills,...), could be a magnet to draw businesses, people to the area, and improving the lives of people in the communities (from older retired people to young grade schoolers). After school education programs and extra Saturday school options aren't unheard of in other countries. Alternatively, the state could see about getting a grant to try a program to offer online learning in technical areas to official state residents using a state ID or driver's license as part of the validation through a provider, if a fee is involved (if after a trial period determined by grant learning and/or job placement can be compared to see what works best). The online learning area has competition with various groups some charge like Gale, Lynda.com, Treehouse, and various others. The free options offered through groups like Goodwill, Khan Academy, Duolingo, Code Academy, and others. There is a third group like Professor Messer that offer the videos for free, but some support services like prepared student notes have a small fee.